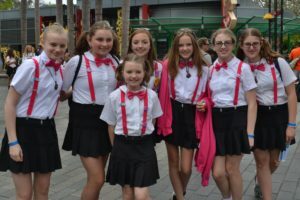 The Women in Defense Tennessee Valley Chapter sponsored the Nerdettes Robotics Team for their participation in the Hydrodynamics Lego League International Open in Legoland, California, May 18-20. The team competed against 78 teams from around the world, including Japan, Korea, Canada, Uruguay, Sweden, Puerto Rico, and others, in robot performance, robot design, project, and core values. The Nerdettes won first place in Strategy and Innovation in the robot design category. This award recognizes the team that uses solid engineering practices and a well-developed strategy to design and build an innovative, high-performing robot. The team’s use of risk management and mission selection strategy is what helped them secure a first place trophy. The team also competed in the Hydrodynamics project, developing a sensor to detect Fat, Oils, and Grease (FOG) in wastewater, and submitted a provisional patent for their design. The FOG sensor implementation included developing an iPhone app to track, alert, and educate people on which foods contain FOG. Their efforts on FOG reduction will be featured in the International Code Council Building Safety Journal. We are so proud of this smart, innovative group of young ladies. Way to go, Nerdettes! Check out more pictures from the competition here.